After a morning rock building trail session up at Pine Mountain, curiosity got the best of me. 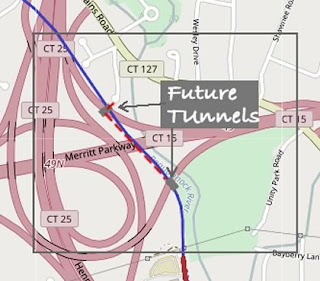 I heard they were finally building tunnels for rail access across the Merritt Parkway ramps at Trumbull and I wanted to check it out. Just like the last trek in, I parked at the end of Rocky Hill Road but this time it looked a whole lot different! It appears this is where one of the the tunnels will emerge. I gingerly hopped over the jersey barriers along the ramp and saw the tunnel work. All the scrub and overgrowth on the walk to the bridge has been cleared. Its a beautiful sight - crossing the bridge! The tunnel stops just short of the actual roadway (ramp) and ends in a huge metal plate. I peaked thru a mini window in the metal plate and saw that the rocks under the roadway have yet to be removed!